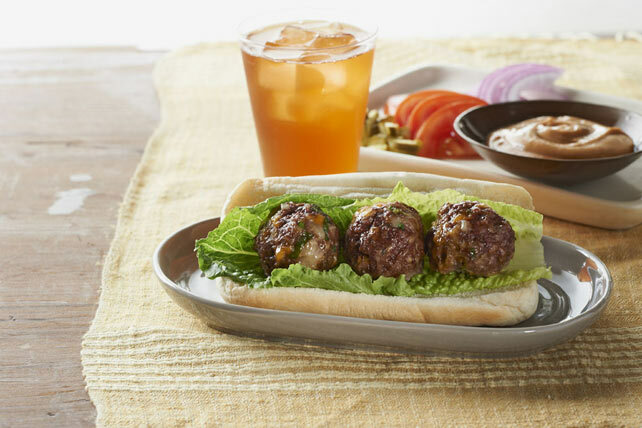 Imagine the flavor of your fave BBQ cheeseburger tucked into savory meatballs, then assembled into warm, sauce-topped subs. Sound good? It is! Mix first 6 ingredients until blended; shape into 24 meatballs, using about 2 Tbsp. meat mixture for each. Place on rimmed baking sheet sprayed with cooking spray. Bake 15 to 17 min. or until done (160ºF). Meanwhile, mix barbecue sauce and dressing. Prepare using KRAFT Mexican Style Shredded Four Cheese with a TOUCH OF PHILADELPHIA, and substituting 1/4 cup TACO BELL® Thick & Chunky Salsa for the barbecue sauce. Place cooled cooked meatballs in single layer in freezer-weight resealable plastic bag. Lay bag flat on baking sheet, then freeze until meatballs are firm. (Meatballs will freeze individually for easy separation when ready to use.) Filled bag can then be removed from the baking sheet and stored in freezer up to 2 months. Thaw in refrigerator several hours or overnight before using as directed.